Every American (okay, every human for that matter) owes it to him/herself to head to Arizona and visit the Grand Canyon at least once in their lifetimes. It’s truly amazing to see how a little trickle of water eventually turned into the Colorado River, which eventually carved out the Grand Canyon. You can approach your trip to the Grand Canyon in a couple different ways. One way is to stay within the park at one of the lodges on the South Rim and take the time to experience all the different things the park has to offer. The other way is to stay in one of the surrounding Arizona towns and take a day trip to the Grand Canyon for a “hit and run” view of the Canyon. Both have their plusses. The part of the Grand Canyon The South Rim is the part of the Grand Canyon most people are familiar with. It sits on the Arizona side and can be accessed all year round. The North Rim is closed from mid-October to mid-May and is not as visited as the South Rim. The benefit of staying within the park is the ability to take your time to view the magnificent Canyon from different viewing points, which you can access by walking the rim trail or taking a shuttle from point to point. For those of you staying for several days, a trip to the Northern Rim of the Grand Canyon would be a lovely addition, though the drive is about 4 – 5 hours long. For those not wanting to drive, there is a shuttle which provides rim to rim service from mid-May to Mid-October. 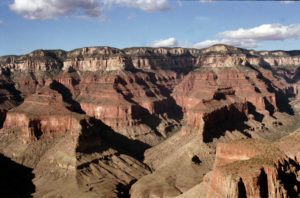 For those staying on the South Rim, there are numerous trails down the canyon, as well as a trail along the top of the Canyon called the “Rim Trail.” If you’re staying in one of the lodges and are planning a day hike into the inner Canyon, just be aware that you probably cannot make it down and back in one day. As a matter of fact, each year around 250 people is rescued from the inner Canyon, the majority of whom are able-bodied young men between the ages of 18 to 40 who attempted to hike down and back in one ay. Don’t be one of them. A good day hike would be a couple hours down and then back up. The hike up will take longer than the hike down. Also, be sure to wear good hiking shoes as some trails can be very rocky. Some people choose to hike down one day and either camp at the bottom or stay in the Phantom Ranch. Be aware, however, that you have to make arrangements well in advance of your trip if you choose to stay at the bottom. Campers require a backcountry permit, and Phantom Ranch is usually booked months ahead. Permits are sometimes available on that day, but why risk it? For reservations at the Phantom Ranch, you can call 888-297-2757. Some people prefer to stay outside the park and visit the Canyon for a few hours and move on. There are numerous areas in Northern Arizona where one can stay and take a side trip to the Grand Canyon, such as Sedona and Flagstaff. While such locations are still lengthy drives (an hour from Flagstaff, two from Sedona), it’s still close enough for a day trip. Both Sedona and Flagstaff are lovely places to stay, with Sedona being the most ‘touristy” of the two towns. Flagstaff, to me, is the quirkier of the two, perhaps because it is a “university town,” home to Northern Arizona University. Sedona and Flagstaff are also visually different. Flagstaff is surrounded by a pine forest while Sedona is in “red rock” country. Sedona abounds with numerous high-end resorts, galleries and expensive eateries. Flagstaff is cheaper all-around, with inexpensive lodging and restaurants. Both are close enough for a day trip to the Grand Canyon. Of course, you can always opt for an even quicker bus tour, hopping from one tourist stop to the next. But, why not take a cue from that little trickle of water which started it all? Take your time and enjoy the view. Coleman Red Canyon Tent Review – What You Need To Know Before You Buy! Actually experienced hikers can hike down to Phantom Ranch (next to the Colorado River) and back in a day. Most descend the South Kaibab Trail and ascend the Bright Angel Trail, which has drinkable water along the trail. Because of the change in elevation (from 7,000 feet to 2,000 feet), hikers should dress in layers to keep comfortable. Diane is correct to warn casual hikers not to try this type of hike. An alternative to Grand Canyon is to go hiking in Sedona, Arizona. This place has a lot to offer. Breathtaking views, picturesque landscapes, and the best place to go hiking.